It's hip to be square. Squares are the building blocks of quilting and this die cleanly cuts perfect quarter squares even through multiple pieces of fabric. Every time! Four quarter square triangles sewn together form an 8" finished square with the straight grain on the outside edges of the square. Use to create 8", 12" or 16" designs. 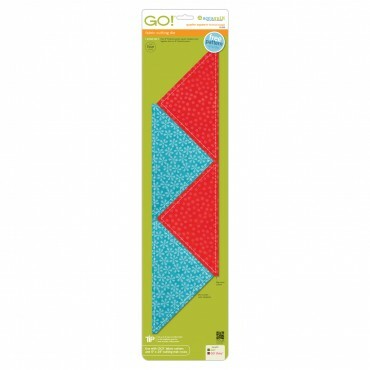 This large quarter square goes well with the GO! Square-8 1/2" (55058), GO! Half Square-8" Finished Triangle (55400), GO! Half Square-4" Finished Triangle (55031) and GO! Square-4 1/2" (55060 or 55018).